Why: The performance features performers who have all drawn on their culture and family traditions to create authentic and meaningful art. The event will shed light on why these songwriters do what they do. 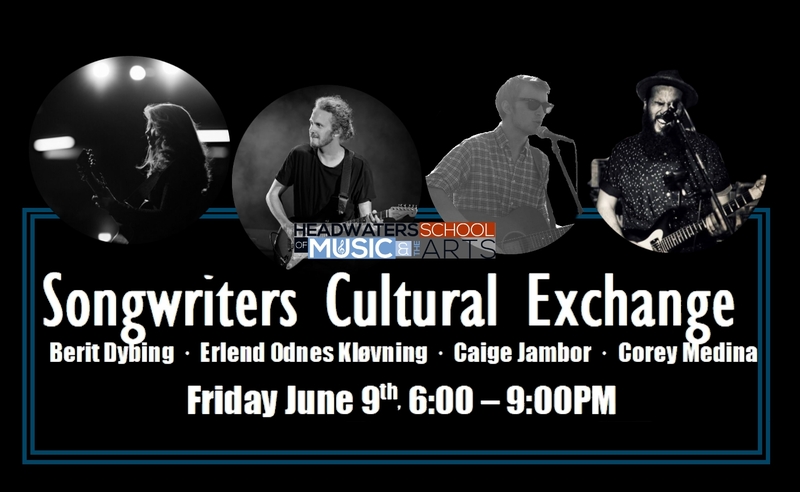 Berit Dybing, Erlend Odnes Kløvning, Caige Jambor and Corey Medina will take the Headwaters Music and Arts stage on June 9th from 6-9pm. Coming Home: Songwriters Cultural Exchange will be a mix of craft talk and performance. The audience will have the opportunity to listen to the four young singer/songwriters give insight into the songwriting process in between performances of their own songs. Berit Dybing is a free-lance singer-songwriter/ entertainer from Bemidji, MN. She is now circulating around Minnesota and Europe, after spending a year studying Jazz and Vocal Performance in Norway. Erlend Odnes Kløvning is a free-lance musician and performer, from Hamar, Norway. He has spent the upper half of his life studying jazz music and playing the guitar. After graduating from a music-intensive high school in Stange, he continued his jazz studies at Trøndertun Folkehøgskole in Melhus, Norway. Berit and Erlend share a band called Bareland. The band bloomed out of the experiences they shared while studying at Folkehøgskole the last year. Their music is inspired heavily by the concept of identity. Berit’s texts and Erland’s melodies circle each other and speak of the relationships people form, and the environment that surrounds them. Caige Jambor is a touring musician from Bemidji, MN. He comes from a strong musical background. Caige taught himself to play guitar at a young age. Since then he has been exploring different genres and instruments. Corey Medina is a Native American Blues Artist from Shiprock, NM. Corey currently plays, writes and produces music with the Incepticons while also traveling with his band known and The Brothers. Corey Medina and Brothers set out to spread light to dark, and hope to the hopeless with their raw, soulful, intimate music and stage presence. This activity was made possible by the voters of Minnesota through a Minnesota State Arts Board Community Arts Education Support grant, thanks to a legislative appropriation from the arts and cultural heritage fund.